Samson’s AWX Wind Instrument system offers true wireless freedom without the hassle of a beltpack or cable. Featuring the world’s smallest clip-on transmitter with a shockmounted microphone and adjustable gooseneck, this frequency-agile UHF wireless system provides high definition sound and 300′ of reliable wireless operation for saxophones, trumpets, trombones, sousaphones and other wind instruments. All Rockville pro audio cables are made with 100% copper which boosts the efficiency of the cable. There is nothing better than 100% copper. Most of the cheaper cables on the market do not use 100% copper, instead they make their cables with CCA (Copper Clad Aluminum). CCA cables do not perform on the level that 100% copper cables perform at. 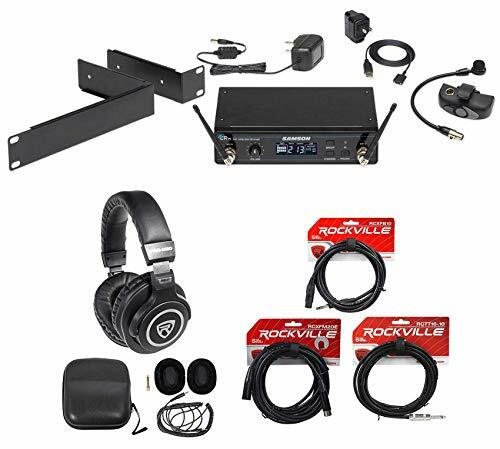 Rockville RCXFM20E-B Black 20 Foot Nickel Plated Female to Male XLR Microphone Cable. XLR Connectors with Internal Strain Relief for Rugged Reliability. 100% Copper Conductors for Enhanced Signal Clarity. 90% OFC Spiral Shield for Effective EMI and RFI Rejection and Flexibility. Length: 20 Ft. Color: Black. Rockville RCXFB10 Black Nickel Plated, REAN Female XLR to 1/4” TRS Balanced Cable. 24 AWG 100% Copper Conductors for Enhanced Signal Clarity. Rockville RCTT16-10 16 AWG 1/4″ TS to 1/4″ TS Pro Speaker Cable. 100% Copper Conductors for Lower Resistance. Black PVC Jacket for Both Durability and Flexibility. Intended for High-Current Applications Only, Not Line-Level Signals. Length: 10 Ft. Gauge: 16. Rockville PRO-M50 Studio Headphones w/ Detachable Coil Cable, Case+Extra Ear Pad. Professional High-Definition Studio Headphones. 40mm Neodymium drivers. Ergonomically designed swivel ear cups. Supreme sound isolation. Accurate sound reproduction. Minimal bleed. Sturdy and durable steel headband and arms. Soft leather headband cover.